Recently, the percentage of Australians drinking drinks such as colas and juices has declined by over 10 per cent. Some believe this drop is the result of consumers starting to enjoy a more extensive range of drinks. And this makes a lot of sense. As Australians have become increasingly aware of health risks, they have reduced consumption of unhealthy food, including beverages overflowing with sugar and chemicals. But this doesn’t mean they are drinking less, as they still need to stay hydrated. The human body is approximately 60% water, and some doctors recommend that we drink up to 2 litres of water each day. Australian market research company Roy Morgan Research found that between 2009 and 2013, consumption of unflavoured sparkling water rose by 15%, while the percentage of Australians drinking drinks such as tonic water or dry ginger ale rose by 20%. Spurred by articles that claim sparkling water may contain tooth-threatening acids, the question arises, are sparkling waters safe? Bondi Dental has the answer! Plain sparkling water, with no added sugar or salt, is pure water that has been carbonated. In this process, pressurised carbon dioxide gas is dissolved into a liquid. As a result of this, carbonic acid is created. This process is the same as that used to produce carbonation in soda. The potential danger is that the carbonic acid could theoretically harm your teeth. After all, it is an acid. Acidity in the mouth can attack your enamel, the protective outer layer of your teeth potentially leading to tooth enamel erosion, sensitivity, and tooth decay. So, what we need to know is: is the acidity of sparkling water high enough to attack and harm your tooth enamel? What’s The Science On Sparkling Water And Teeth? pH is the primary factor in a beverage’s ability to erode teeth. A pH below 4.5 or so can represent a threat to your teeth. The lower the pH, the more acidic a beverage is, and the more it can attack your teeth. Ordinary tap water usually has a pH between 6 and 8, which is just about ideal for the mouth, which has a healthy pH of about 7.4. Carbonating water lowers its pH from 7 to somewhere around 5. This is still in the safe zone – erosion becomes much more likely when the pH drops below 4.5. But when flavours are added, notably the commonly used citric acid, trouble begins and a substantially lowered pH can begin to erode enamel from the teeth, leading to a potential host of dental issues. A 2007 study in the International Journal of Paediatric Dentistry revealed that flavoured sparkling waters can have a pH as low as 2.7, far below the safe pH level and equivalent to the erosive power of orange juice. While that doesn’t sound great, there is a counterbalancing perspective as well. Most dentists believe that the risks of sparkling water are small. Dentist Damien Walmsley, a professor of dentistry at the University of Birmingham says, “There is a theoretical risk of tooth erosion, but the drinks would have to be consumed over a long period of time.” He recommends keeping acidic drinks to meal times for complete safety. Most dentists will say that the best beverage to drink for your oral health is fluoridated water, but sparkling water seems to present a minimal risk. The following advice goes for sparkling water and all carbonated or sugary drinks. Drink with a meal. Drink sparkling water during mealtimes. Chewing increases the production of saliva, helping to neutralise the effect of acid on tooth enamel. Drinking sparkling water with a straw. Drinking carbonated beverages through a straw minimises contact between carbonic acid and enamel. Drink it plain. 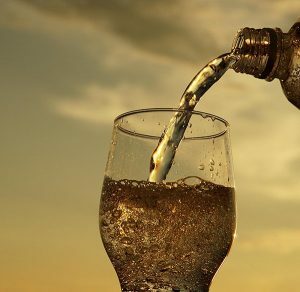 Flavoured sparkling water often has destructive added sugars and adding a wedge of fresh lemon or lime increases acidity, which can increase the potential for erosion. Follow it with water. Drinking regular water after drinking sparkling water rinses the teeth. Wait 30-40 minutes before brushing. Right after drinking a carbonated drink, the tooth surface is slightly weakened. So wait to brush after drinking fizzy drinks.